The father of the field of law and religion, Harold Berman wrote 25 books, hundreds of articles, and one forgotten unpublished manuscript. Upon his death in 2007 at the age of 88, Berman’s literary executor, colleague and former student John Witte, Jr. CSLR Director, discovered a long-lost draft of a book resting at the bottom of a metal filing cabinet. That book, which Berman had spoken with Witte about in 1982, contained the germs of Berman’s scholarship and ideas which have shaped a generation of legal and religious minds. 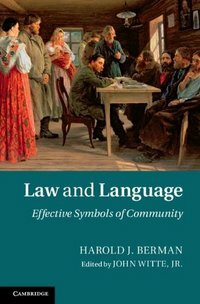 Nearly a half century after the completion of the first draft, Harold Berman’s Law and Language: Effective Symbols of Community(Cambridge, 2013), can now take its rightful place as a distinct contribution to the field of law and religion. An introduction by Witte, assisted by current CSLR student Christopher Manzer (JD/MTS 2015), places the book in the context of Berman’s scholarly pantheon, notes his focus on “legal history and comparative law” and pays tribute to this polymath’s “remarkable ability to think above, beyond and against the times.” The afterword by Tibor Varady, also a former student of Berman and professor emeritus of Law at Emory University, presents the timelessness of his mentor’s arguments in the context of modern cases. Throughout his long and distinguished career, Berman aimed to “integrate his religious faith with his legal training.” Dialogue—with God and others— Berman felt, functioned as a mechanism through which humanity could to find ways to reconcile differences and build community in the face of divergent viewpoints. In Law and Language, Berman sought to “provide an understanding of law that reveals its ability to build community and foster peaceful relationships among individuals and nations.” When legal language becomes arcane and highly technical its interaction with society is limited, impeding its ability to forge relationships. For Berman, legal language, and its associated institution, possesses the power to help resolve conflict, foster healthy ways of cooperation, negotiation, and of modeling ways for people to live together harmoniously. With an eye toward interdisciplinary studies and comparative legal scholarship, Berman put his academic specialties into practice, seeking out opportunities to visit Russia, during the height of the Cold War. In his travels, he hoped to understand the ways in which law affected people, interviewing judges and lawyers and encouraging conversation about the interplay between the American and Russian legal systems. Through Law and Language, Berman aspired “to work out a theory of ‘communification’: to form sympathetic bonds of community through better mutual understanding of each other’s cultures, languages, and laws, and more conversation to overcome the ‘tragic disunity which now threatens to destroy us.’” A tall task, given the major political differences dividing the two countries—and one that is equally relevant in today’s highly fractured global society. Berman’s Law and Language serves as a prologue to his seminal Law and Revolution series, presenting a window onto themes that absorbed his life’s work and reflected in the chapter titles: “Language as an effective symbol of community”; “The language of law”; and “The development of American law and legal language.” His groundbreaking scholarship challenged the legal world to reflect critically on the place of interdisciplinary studies within law. Berman probes crucial topics in the field with an eye toward how legal language can foster peace and reconciliation. Witte’s resurrection of Law and Language pays homage to his mentor and demonstrates the ways in which Berman laid the groundwork for current thinking on the intersections of law, language, and ethics.